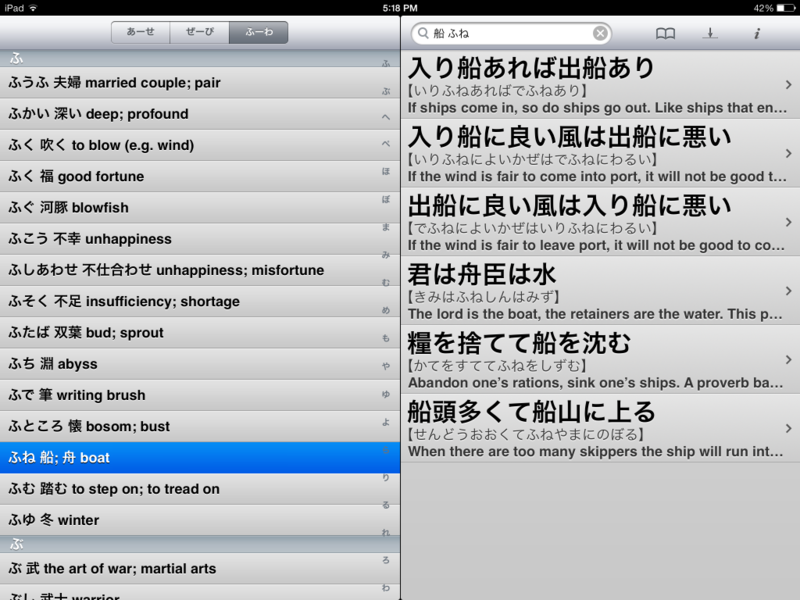 This app allows you to translate every single imaginable proverb from Japanese into English. Each proverb has a literal translation, an English translation and an equivalent English translation. Some proverbs also have related proverbs that you might be interested in. Proverb text can be copy and pasted from this app. Whether you want to copy and paste the Japanese text or the English text, you’ll be glad to know you can do both. 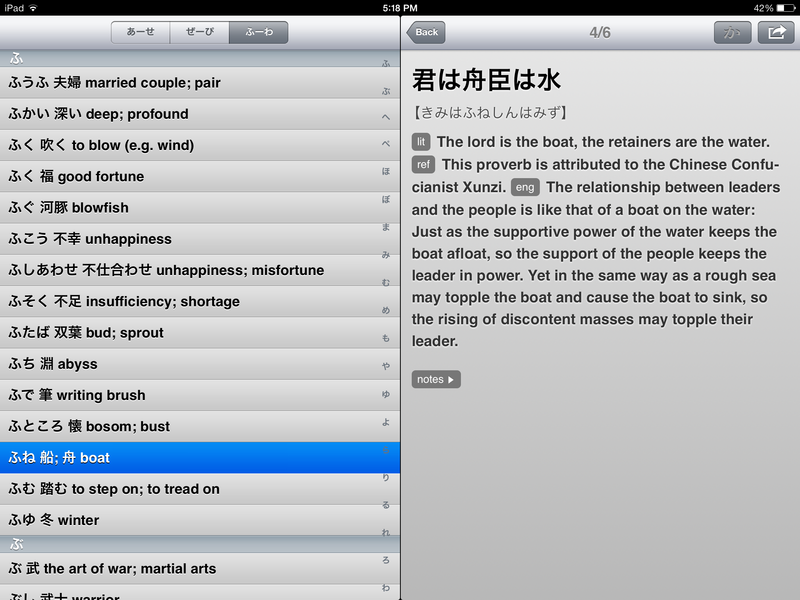 Not to mention that this app also lets you take notes on any proverb you’d like as well as bookmark proverbs. If you take a look below at the two images you will see two description styles on the right side. The first image shows a full-screen description where the user has to tap on the “back” button to return to the sub-category of proverbs. In the second image you can see a half-screen description that still displays the sub-category. For an extra $4.99 users can upgrade the audio reading of proverbs. This upgrade will also give the user fine-tune control over the voice that reads the proverb out and the speed of which that they read with. 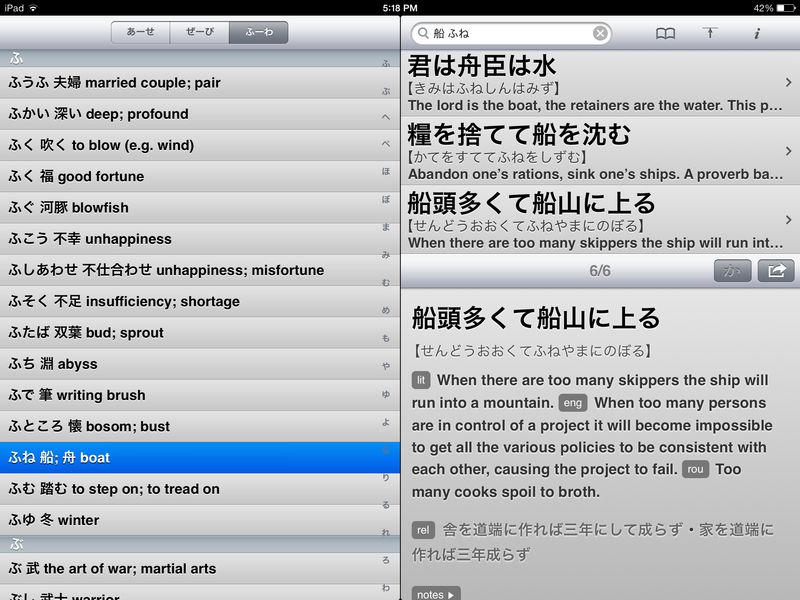 This app has a lot of Japanese proverbs! I don’t know the exact number but I do know that it’s over 1,200. Having a rough translation, a literal translation and an English interpretation for each proverb is really awesome as well. The price. The price is really high. Obviously the developer spent a lot of time translating these proverbs but it doesn’t mean this app should cost $19.99. I’m sure people would rather just Google Japanese proverbs before dropping so much money on this app. The $4.99 voice add-on is just another slap in the face. The price is all based on perspective though. When you consider that Googling proverbs only nets you with 100-200 Japanese proverbs, you’ll start to see the value of this app. Also when you considerÂ print versions of this app costs $50, this app will stand out even more. For me, it’s not worth it. But that doesn’t mean it’s not worth for other people. It’s a quality app and way cheaper than other alternatives. 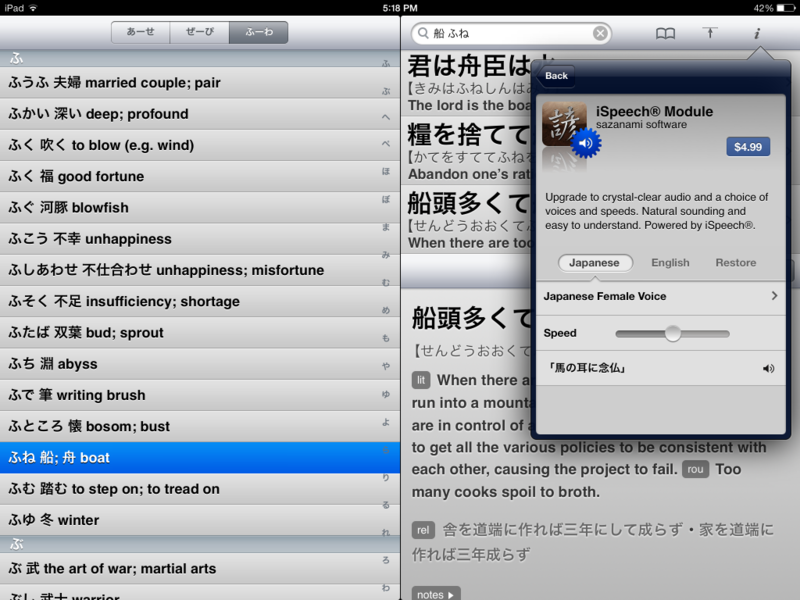 So if you need a dictionary like this and you have an iPad, you might as well purchase this app. If you’re interested in finding Japanese proverb translations then I would just use Google. Sure, using Google for proverbs only gets you about 100-200 proverbs. If spending $19.99 on A Dictionary of Japanese Proverbs for iOS seems worth getting a library of 1,200+ Japanese proverbs, then it would be a good choice for your needs.